It's the tail end of October, and I've just had my summer holiday. OIST actually granted me two days of summer leave even though I started only in September. One part of my new job is user training. I've prepared two training classes — one an introduction to HPC, and one on GPU programming — and I gave them both last week. They went decently well; better than I expected for a first course draft. Seemed like a perfect time to take two days off for a four-day weekend with Ritsuko here in Okinawa. With the move and the job we haven't had much downtime together in a while. Summer vacation in late October may sound daft, but it's still about 30° here most every day; summery enough for me. And four days is plenty of time since we don't travel anywhere. A week at some vacation spot is just 4-5 days in practice without the travel and packing time. This is a great movie — if you like kaijuu movies, of course. It's classic Godzilla, but starting over with a new origin story. Original Godzilla was about nuclear testing; this is thinly veiled commentary on the political (mis)management of the Touhoku disaster and Fukushima meltdown. It's really an ensemble movie about politics as much as about a big lizard with bad temper. Good casting overall — several characters bear more than a passing resemblance to real politicians. The female lead (who is supposed to be a Japanese-American) could have benefited from an actor with a little more (or, you know, any) subtlety and at least a basic grasp of English. Godzilla itself lives up to the part; they really manage to convey the sheer mass and scale of the monster. It really feels physical - the CG effects in most movies feel like empty shells projected onto a screen, but this feels like it could really have been an actor in a rubber suit. That is high praise. The story? It's a Godzilla movie. Monster appears. Monster destroys Tokyo. People flail about trying to stop monster from doing same. The rampaging and action sequences are extremely well done, and, again have a sense of physicality to them that many movies fail to convey. Excellent movie. ﻿I sincerely hope they're working on the next one. The Okinawa Industrial Fair was at Onoyama park this weekend, just a few hundred meters from home. It's a yearly exhibition for Okinawan producers of consumer and industrial goods. Sounds dry, perhaps, but it's anything but. something, a lot of it edible or drinkable. It's a big family festival that mixes serious industrial exhibitions, university and NPO projects, and small shops showing (and usually selling) their goods. You find hot sauces, hair tonics, music instruments, CNC casts, awamori, cement, beer, flowers, solar panels, robots, prosthetics, chiffon cakes, kariyushi shirts, power stones, salt, PVC pipes, graves, and so on and so on. And of course lots and lots of places that sell food and drink. An underwater Crown-of-thorns hunter robot by students at a technical college. The starfish eat coral, and can devastate an area. This one has a vision system to recognize the specific starfish, and syringes at the front that inject vinegar which kills them. An exoskeleton showcased by a couple of students at a technical high school. Mostly passively compliant with counter-springs, though the hands are servo-controlled. The kids in the audience loved the demo. Okinawan-style grave. The price of a car — though you obviously get more years of use with the grave. One company displayed the manhole covers they produce for the various local municipalities in the prefecture. Cool, though they weren't for sale. It's spread out over much of the park, with hundreds of outdoor stalls, and an indoor exhibition at the budokan. We spent all of Sunday afternoon there, and still had to skip one section altogether. It's big, it's noisy and it's a lot of fun to wander around, eat and drink, and look at the crowds and at all the things on offer. One of the tent areas, with the Budokan housing the main industrial exhibition in the background. The Kerama islands is a group of beautiful islands in the Pacific with coral reefs, white beaches and few people. It's a good area for snorkeling and diving. It's also just half an hour away from Naha by boat. A fishing boat berth in the Naha harbour area. So on Monday we took a half-day snorkelling tour (with Marine House Seasir) to the Kerama islands. Breakfast at home, go to the harbour and on to the boat, two hours snorkelling among beautiful reefs, then back in time for a shower and lunch at home. Perfect! A determined-looking trio against the sun-dappled surface. A section of coral showcasing the variety in the area. It was a fairly big boat with almost thirty people on board. These people are doing a trial dive, not just snorkelling. A fun day trip and a great summer vacation. Have to do it again some weekend soon. Next time perhaps try diving myself; it looks like a lot of fun. So we survived our first typhoon here in Okinawa intact. It was — and is — quite a strong one, but also fairly small, and it veered off enough that it didn't hit the main island directly. Our cellphones alerted us with a flood warning along the coast in mid-afternoon. A couple of evacuation notices followed — just invitations to evacuate for those that wanted to. The weather grew worse, and when we went to bed by late evening it was obvious even to us that going outside would be reasonably stupid. But there was never any danger indoors. We went to sleep with the sound of the wind howling outside. There never was much reason to worry, of course. Okinawa gets a few typhoons every year, so buildings and infrastructure can handle it just fine. When Ritsuko went to the supermarket in the morning, people were loading up on snacks, beer and awamori, clearly focused on making the best of an evening spent at home, not worrying about the typhoon. We still had strong gusty winds early this morning, though it calmed down a few hours later. A few residents were outside picking up fallen leaves and branches as I was leaving, but mostly people were getting up for another weekday at work or school. We got our first typhoon here in Naha. 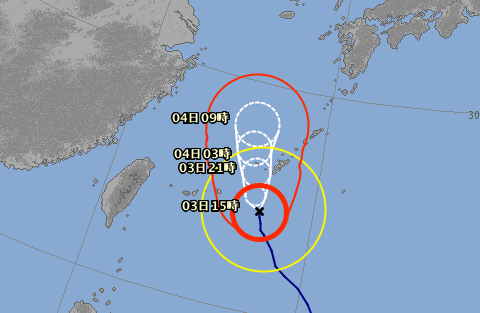 As I write this around lunchtime, typhoon #18 is south of the main island, and the weather is still fine, with a breeze and scattered rain showers. But it's a small typhoon with a strong center (50m/s winds with up to 70m/s gusts) so the conditions can turn ugly very quickly. As a result OIST has suspended operations today. While we could have gone to work as normal this morning, the buses and monorail have already stopped running. Most shops are closing already as well. It doesn't affect my work a lot. I just logged in remotely and working as usual. A lot of other staff can spend the day at home preparing for the typhoon, and researchers can surely keep themselves busy writing papers and grant applications. But I know that this is a major problem for some people. The facility management division people have been running ragged clearing the outside and shoring up buildings with sandbags and tarps. Lab 4 is currently under construction, so the area is stripped of vegetation and the red soil laid bare. If large amounts of that soil runs out into the Onna bay, that would kill the local wildlife and ruin the fishery and seaweed business. Some research labs also need special contingency measures. Some labs have long-running experiments that need attention. There are labs with tanks full of zebra-fish, nematodes, fruit flies or various kinds of plants, and they all need food, water and constant care, typhoon or not. So while most people stay away from OIST today, others have been coming in — no doubt equipped with instant ramen and sleeping bags — and will spend the typhoon caring for them. Power cuts are not likely here in Naha. But we still bought some water bottles, and we've made sure we have everything we need for at least two-three days. We're as prepared as we'll ever be.